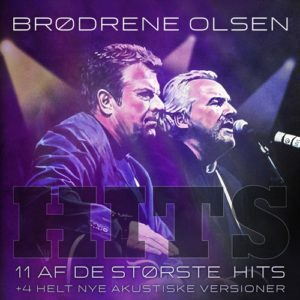 The 2000 Eurovision Song Contest winners, the Olsen Brothers, from Denmark has just released another greatest hits album simply titled Hits. The album contains new acoustic versions of four of their songs, one of them being their Eurovision winning song Fly On The Wings Of Love. The Olsen Brothers have been in active on the Danish music scene for more than 45 years and as such naturally have a big catalogue behind them. Hits that was released a couple of days ago is not their first Greatest Hits album, but with four new acoustic versions they make sure there still is a reason to buy it. On the album we of course find the song that ended up as a, to many, quite surprising winner of the Eurovision Song Contest in year 2000; Fly On The Wings Of Love as well as several of their national final entries. They participated 6 times in the Danish final, the Dansk Melodi Grand Prix, and Jørgen Olsen took part three more times as a solo singer, always with his own songs. Their last duo participation in the national final was in 2005 with Little Yellow Radio, a song that came second and is to be found on this album. Jørgen participated solo last in 2007 with Vi Elsker Bare Danske Piger (We just love Danish girls), but only ended 7th in the final. The four new acoustic versions includes their very first Danish final song, and also one of their most famous ones, San Fransisco, that came second in 1978, but also their Eurovision Song Contest winner Fly On The Wings Of Love. The two other acoustic versions are of Go East Go West and Vienna Express. Walk Right Back, which was a part of their opening act at the 2001 Eurovision Song Contest in Copenhagen, also works as opening song on this album as can be seen in the tracklist below. At the moment the Olsen Brothers are to be seen in the TV2 programme "Toppen af Poppen" where they sing cover versions of other well known Danish singers who then sing cover versions of songs by the two brothers.